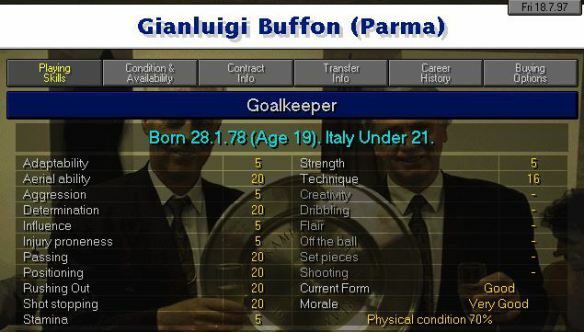 Back in 1997, Buffon wasn’t even Parma’s No.1. Fast forward 20 years and Parma have been and gone, while Buffon, well, what a career he’s had. 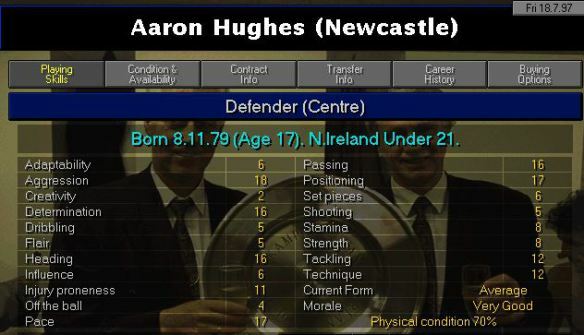 Just look at those ’20’ ratings in CM97/98 – it’s fair to say the researchers nailed his skills even aged 19. 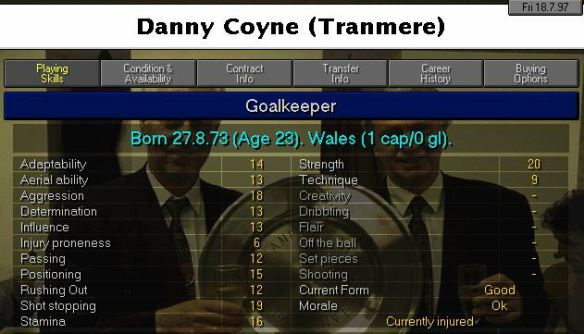 Whether FM18 is his last appearance in Football Manager remains to be seen. Remember when Roy Carroll was Manchester United’s first choice goalkeeper? Now aged 40, Carroll is at Linfield – and was even on the bench for Northern Ireland in their World Cup play-off against Switzerland. Rewind the clock 20 years and we find our man at Wigan, just starting out his career and showing a lot of promise. I guess he fulfilled that promise by playing Champions League football at one of the world’s biggest clubs, but to be honest I never saw it coming. Everyone’s favourite pyjama-wearing goalkeeper is somehow still playing and started between the sticks for Hungary at Euro 2016. He now plays his club football for Haladás in his homeland. 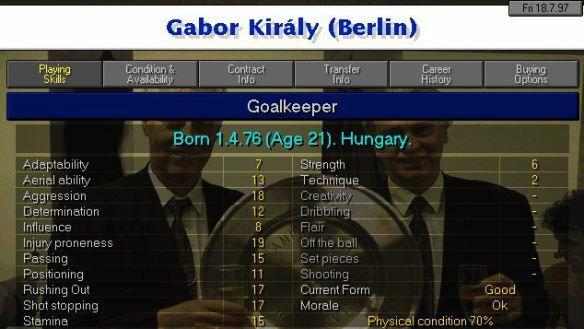 Haladás is the Hungarian word for ‘progress’, which is ironic seeing as they have a 41-year-old in nets. The former Newcastle stopper insists he still hasn’t retired despite being clubless at the beginning of the 17/18 campaign. This could be due to the fact that he’s recently released his autobiography, or maybe he just loves playing. Given was hugely promising on CM97/98 and, much like in real life, rewards you for sticking by him around four seasons down the line. He went on to get 134 caps for Ireland, which is mightily impressive. What I love about Aaron Hughes is that he’s still playing international football, along with Roy Carroll, having been part of the Northern Ireland squad that narrowly missed out on the World Cup in Russia. Ok, this is a technicality. Pirlo has just announced his retirement but is still in FM18 as he retires at the end of the MLS season. He starts on CM97/98 as a young Forward (Left), a far cry from the central midfield position he made his own. That passing figure should improve, as will his set pieces. 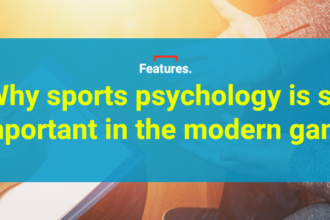 Veron recently decided to come out of retirement at the ripe old age of 42, and is technically player-chairman of Argentine side Estudiantes. 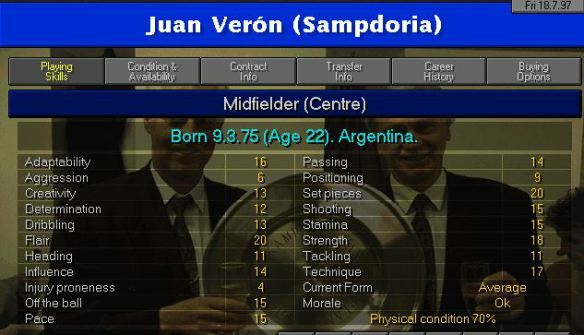 He’s a gifted 22-year-old on CM97/98, but I don’t think he’s up to much on FM18. Wait, what? Robbie Keane is still playing? Yes, the striker who turned out for Inter Milan, Liverpool, Leeds, Celtic and Tottenham (among others) then finished his career in the USA with LA Galaxy. Except he didn’t. 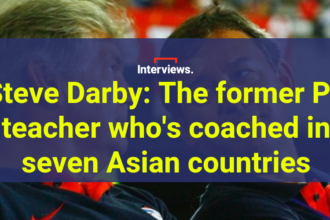 Now aged 37, he has signed up for Indian Super League side ATK. I wonder if he still has the same celebration. 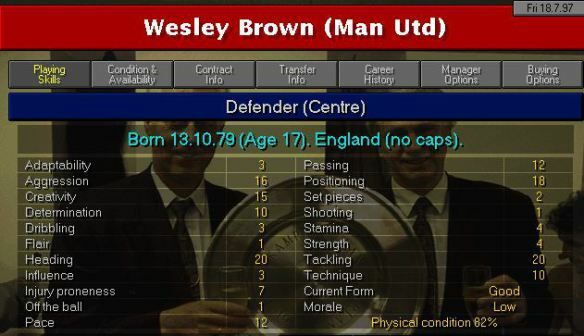 You’ll also find Wes Brown in the Indian Super League, or ‘Wesley’ as he was known back on CM97/98. Brown has signed up for the Kerala Blasters, where I’m fairly sure we won’t see a creativity of ’15’. Do I want to start a new save in the Indian Super League? I’m thinking not. 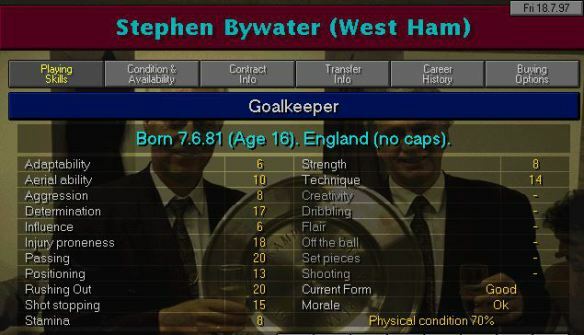 Bywater is a bit of an anomaly, in that his move to the Indian Super League in 2015 put him in the shop window. He returned to England with Burton Albion, and has featured several times this season already. Considering he’s only 36, we might see him in the FM database for another few seasons. So, this is awkward. 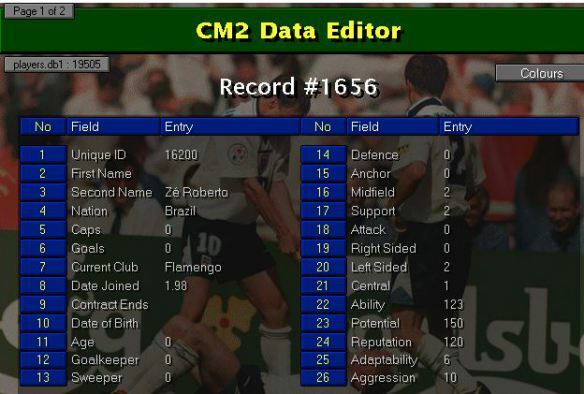 Ze Roberto starts CM97/98 at Real Madrid, but by the time the patch came out he has been moved on to Flamengo. Move on 20 years and he’s back in Brazil, having played for German giants Bayern Munich at the peak of his career. He’s still playing at 42, so fair play to him. No, not the goalkeeper. The uncompromising left-back, now of Birmingham, but then at Watford. That aggression stat looks a bit low. And as if to prove that point, here he is as a player-coach with ’20’ for aggression. I like that his squad number is higher than his age. This one’s questionable, but I’m running with it. Brown was once a promising midfielder; you may remember he scored a load of goals for Sheffield United and earned a move to Tottenham. But before all that, back in 1997/98 he was at Manchester City doing Georgi Kinkladze’s dirty work. Brown has recently been sacked as player-manager at Port Vale, having started the 17/18 season in the hot seat. 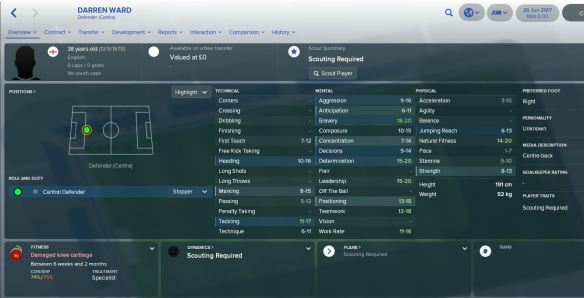 He registered himself as a player for the current campaign, so you can still pick him up on a free in FM18. Coyne went on to win 16 caps for Wales. Now aged 43, he’s Shrewsbury’s goalkeeping coach – and also registered as a player. He’s valued at an impressive £110. I know what you’re thinking… Andy Todd! No way is he still playing. It’s not that Andy Todd. This is Nottingham Forest Andy Todd, who is erm, on a free transfer in CM97/98 despite being contracted to Forest. I know nothing about this kid but those stats aren’t awful. Here he is aged 38 where he is…still on a free. Good luck to him, I say. Another manager who is out of work and apparently still a player. Here he is as a 16-year-old trying to muscle his way past Andy Hinchcliffe at Sheffield Wednesday. I have no idea how Lee Hendrie has made the cut. Last seen playing Soccer 6’s for England, Hendrie’s last club was Redditch in the Southern Premier League. He’s available for free in FM18. 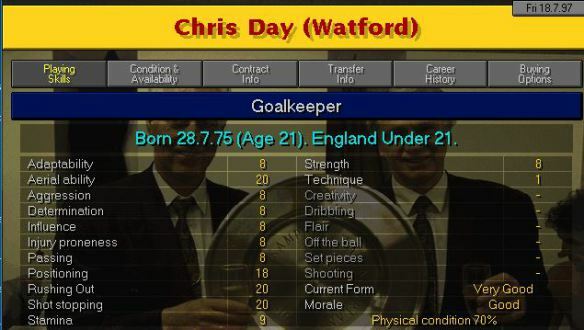 He’s also now a CM, where he played once for England. Back in 1997/98 he was more of a winger. But he’s still available in 2018, on a free transfer. Quite who is in a rush to buy him, I don’t know. But here he is having been released by Bristol Manor Farm at the end of last season. Darren Ward scored a Premier League goal for Watford in the 1999/2000 season before featuring for a string of Championship clubs including Wolves, Crystal Palace (at the time) and Milwall. He was most recently at Yeovil. Bad luck if you want to sign him in FM18, as he’s out for two months. I initially missed Kenny Miller, but my excuse is that ‘Kenneth’ wasn’t in the Hibs squad, instead hanging about on a free transfer. Creativity of 20 is…generous. Mind you, so is 20 for technique. Good old Kenny. Or Kenneth. The veteran stopper starts as a promising youngster at Stenhousmuir, and little did we know that he’d still be going 20 years later. These stats aren’t bad at all. Alexander is now at Livingston, having clocked up over 200 appearances for Cardiff and played for Scotland three times. Day starts as one of Watford’s star men, which I guess you’d expect as he’s in the England Under-21 squad. Nowadays he’s player-coach at Stevenage – but he’s also 41 and won’t be adding to his six Under-21 caps. I’m toying with the idea of putting these ageing outfield players together as a squad. Ainsworth is technically player-manager at Wycombe, although he doesn’t do much of the playing these days. 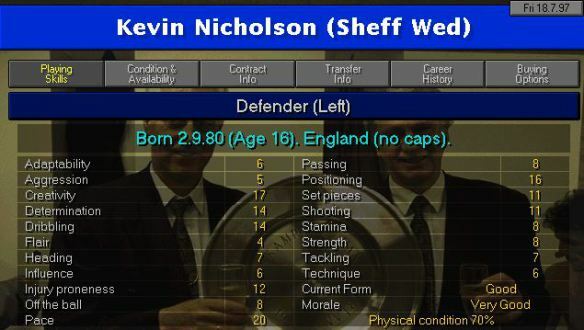 In CM97/98 we find him at Port Vale with pace to burn. By the time he’s 44, his pace has been burned. He works hard though, which is probably for the best. This is one of my favourites. Miura is already 30 in CM97/98, so you can see where this is going. Yes, somehow he is still playing, aged 50. Even Wikipedia says so. The striker went on to get 89 caps for Japan. Somehow I don’t think he’ll reach 90 at the World Cup next summer. Douglas came out of retirement to play for Arbroath at the start of November, which is ridiculous considering he’s 45. But fair play. I imagine he’ll be reinstated to FM18 in a data update, provided he sticks around. I was amazed to find Cureton is still playing. He’s now at Farnborough in the Southern Premier League. He’s another I can’t find on FM18, but I’m sure if I loaded enough leagues he’d be there. I bet he still scores a shed load of goals too. Clinton Morrison is still turning out for Mickleover Sports in the Northern Premier League, which I guess counts. Maybe I should have put a lower level limit on but it matters not, Clinton has made the list. I don’t even know if Mickleover Sports are on FM18, but if they are, that’s where you’ll find Clintycakes. Are there any players Dave has missed? 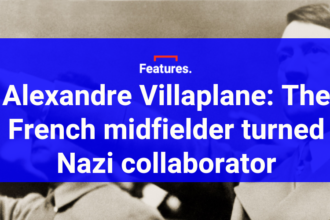 Let us know at the @FM18Project. Follow Dave Black on Twitter, check out his CM97/98 blog, and buy his CM97/98 book here.